A primary goal of ETC Green is to help as many clients Go Green as possible, in whatever ways possible. Our business model supports a wide range of business relationships from hourly consulting to complete project development and site build-out. Some clients prefer hands-on involvement while others simply wish to have their properties developed with little direct interaction. Whether you need general advice on how to Go Green, project management working with contractors and suppliers, or believe your property has utility scale Green Energy potential, ETC Green can help. Source: “Olduvai Revisited 2008,” The Oil Drum, by Luís de Sousa and Euan Mearns. 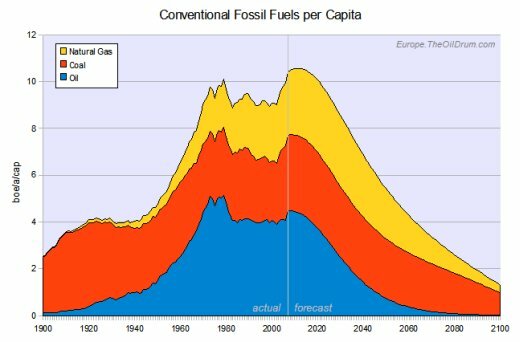 Cumulative peak is Data sources: Jean Laherrère for natural gas, Energy Watch Group for coal and The Oil Drum for oil. By the end of this century – a mere 90 years from now – we must have an energy infrastructure powered exclusively by sustainable and renewable sources. Please contact us for more information on our Consulting Services.